Looking for an empty meeting room is a zero sum game of musical chairs. People are always poaching empty rooms or overbooking more time than they really need. Jarvis Office uses AI and Calendar integration to tell you which rooms are currently available for a meeting. If a room is booked, but has nobody in it, Jarvis Office lets you rebook it under your name. If a room is available but has people in it, Jarvis Office lets you know about it before you make any bookings. There are cameras installed in each room, which take pictures during a designated time interval (e.g. 5 mins), which are uploaded into S3. Once an image is uploaded, a Lambda trigger analyzes the image to determine if there are people in the room. It updates the room status in a calendar, which is currently stored in DynamoDB. When you ask Alexa to book a room, Alexa makes an informed decision, taking into consideration the room availability and its emptiness. The main challenge was to finish the task within the given time constraints. We first wanted to add facial catalog recognition but realized that detect labels was a better Rekognition service to use for privacy and not having to worry about cropping and zooming on faces. This is not a simple calendar assistant, but a smart one! The S3 integration and automatic updating of DynamoDb is freaking awesome. You don't have to get super high tech with incorporating vision analysis, Detecting Objects in Rekognition can suffice for many common use cases. Very easy to build a fast prototype. face recognition? or at least the number of people in the room. 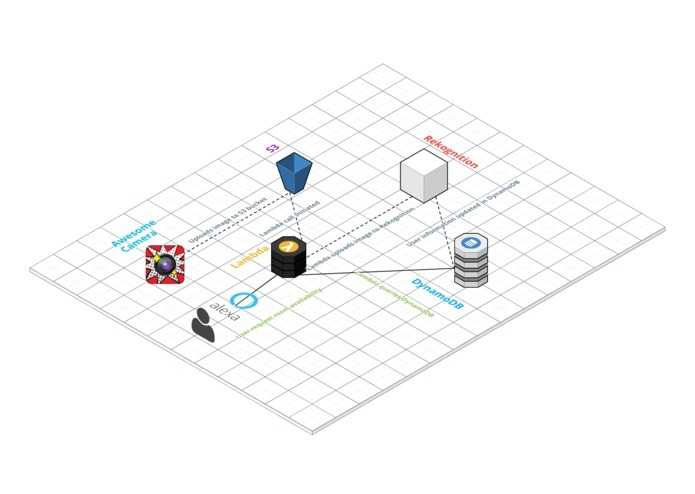 I led the team and coded the hookup between the DynamoDb entries and the Alexa Skill Lambda. It was a lot of fun working on the alexa skill. The process involved first, creating an AIM role to access other AWS services, second creating the lambda function that will be triggered by the "Alexa" prompt. Third, the skill and the intents to invoke responses.